As the weather cools down each year the great insulation debate heats up. Goose and duck down fill are among the premier insulators on earth, trapping air and creating pockets of warmth around your body with very little weight. Synthetic insulation, on the other hand, can’t match the warmth-to-weight ratio of down but breathes better and retains most of its ability to insulate when wet (that’s a major plus for serious outdoor use). Below we break down these considerations and more in the down vs. synthetic discussion, including compressibility, durability, cost, and comfort. We hope it’s helpful in picking your next jacket or sleeping bag. Without a doubt, down holds the warmth-to-weight crown. 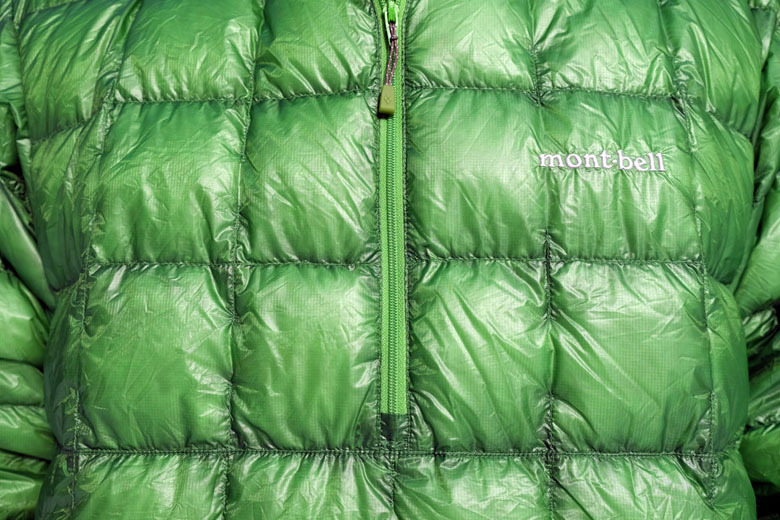 Down fill, and particularly premium goose down at 800-fill power and above, offers the ultimate in lightweight warmth. The lofty clusters of goose plumage (not the actual feathers, but the fluffy stuff beneath) do a superb job at trapping heat and holding it close to your body, and you need more synthetic insulation to achieve the same warmth. 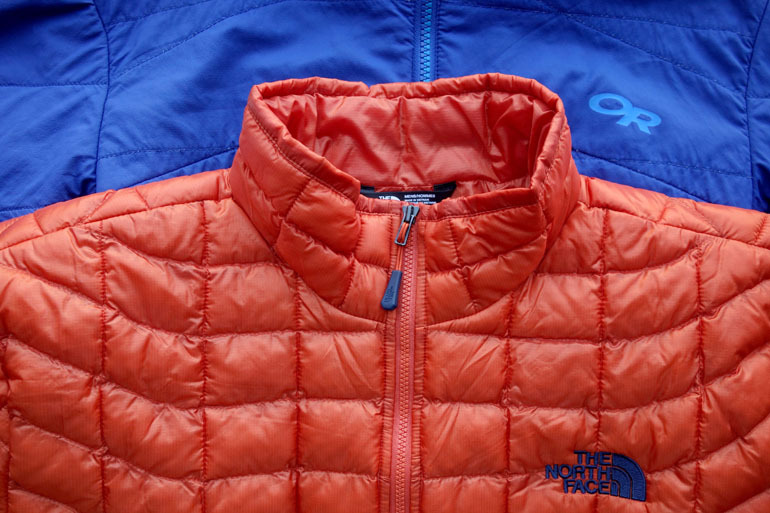 Synthetics are making good efforts to catch up in this regard, including new high-end insulations like PrimaLoft Luxe and Gold, but the warmth gap remains for the foreseeable future. For example, take two backpacking sleeping bags: the synthetic Mountain Hardwear Lamina Z Flame and down Feathered Friends Swift Nano 20. They share a similar shape and temperature rating (the Lamina Z Flame actually is rated at 22 degrees and Feathered Friends is known for being conservative with their ratings, so the Swift Nano 20 will be noticeably warmer). Yet the Mountain Hardwear bag weighs 2 pounds 11 ounces while the Feathered Friends bag is 2 pounds 1 ounce. If you’re willing to settle for slightly less shoulder space, the down Western Mountaineering Ultralite 20 is a feathery 1 pound 12 ounces. So even against one of the top synthetic bags on the market, that 10 to 15-ounce weight difference is very significant when you’re carrying all your gear on your back. Like warmth, down is known for its compressibility. You can stuff a lightweight down jacket to about the size of a water bottle, and much more tightly than a comparable synthetic. Keep in mind that the quality of down (and therefore its loftiness) matters in this equation. Low and medium quality down (ranging from about 450 to 650-fill power) aren’t as far ahead of high-end synthetics in terms of compressibility as you might think. But the higher the down fill power, the better it compresses, and premium down gear items are as good as they come. One thing to keep in mind when stuffing your down jacket or sleeping bag is that leaving it stuffed can cause permanent damage. Compression sacks for down sleeping bags pack them down incredibly small, but you should use the much larger nylon sacks to let them expand when they are in storage. If you fail to take your gear out of its compression bag or stuff sack, you can damage the down and it may never regain its original loft. Perhaps the single biggest selling point of synthetic insulation is its ability to insulate when wet. Down soaks up water, clumps together, and loses its loft, thereby losing its insulating properties. If you’re wearing a down jacket and the rain comes, you better have a waterproof shell or the ability to get inside. If you’re backpacking and your down sleeping bag gets wet, it will produce only a fraction of its advertised warmth. This can make for long and potentially dangerous nights in the backcountry (for this reason we oftentimes stuff our bag into a waterproof compression sack). Synthetic insulation does not soak up and retain water like down and therefore keeps on insulating. This means that synthetics can be worn during light to moderate precipitation, and in addition to not soaking up moisture from the outside, these jackets do not become inundated with your sweat on the inside either. 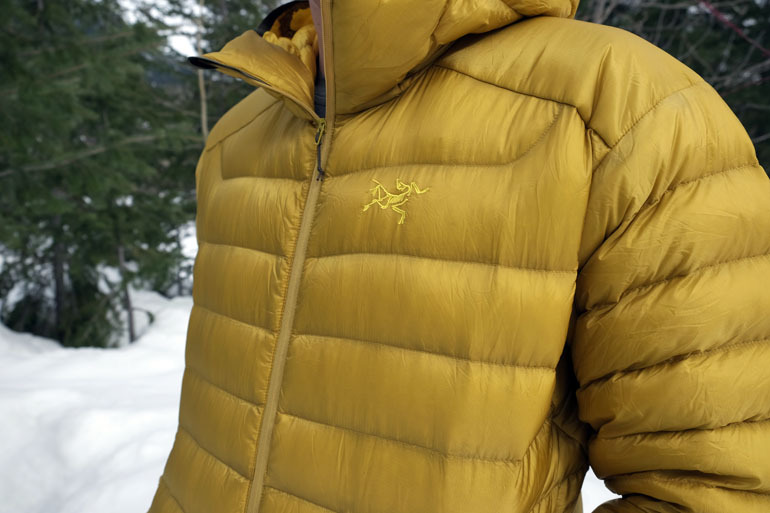 For these reasons, synthetic jackets are the preferred insulating layer for high-output activities like backcountry skiing, climbing, and hiking in cool weather. 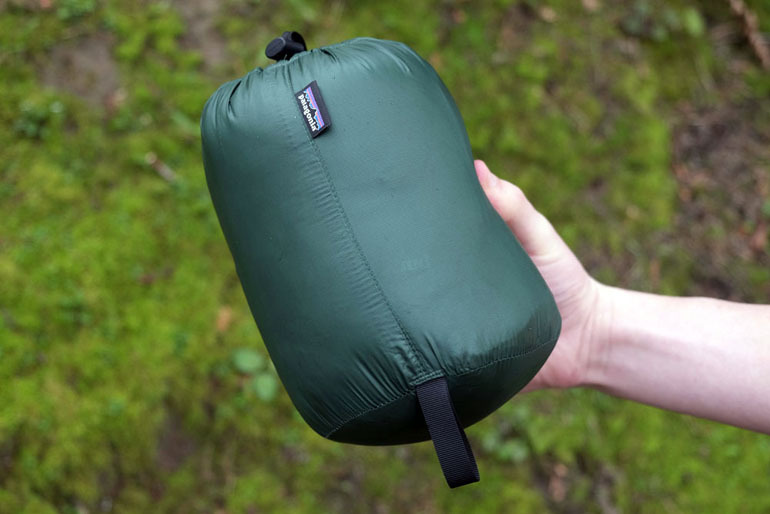 It’s worth noting that many new down jackets and sleeping bags use either a DWR treatment on the shell or the down itself (and sometimes both). Treated down is an attempt to block out water and keep the down dry and insulating, and the technology goes by the name of DownTek, DriDown, Q.Sheild, Down Defender, and others. These treated clusters resist water to a reasonable degree and are in many ways superior to non-treated down. However, treated down is not an impenetrable barrier and instead should be thought of as a light to moderate deterrent to water and other moisture. Down is such an effective insulator because it traps your body heat and keeps it there. Synthetics, on the other hand, aren’t as good at trapping heat and therefore breathe much more effectively. You’ll really notice the difference during high-exertion activities: synthetic insulation has a way of regulating your body heat so that you don’t get too hot or too cold. If you were to wear a down jacket when hiking quickly or cross-country-skiing, for example, you would overheat rather quickly. But a good synthetic can keep you warm while still allowing enough air to escape. For these reasons, synthetic jackets are ideal for activities like climbing, biking, ski touring, and others. And you always can throw on a breathable softshell jacket on top for added protection. Without a doubt, synthetic insulation is cheaper than down. The cost of down continues to rise—supply is low and demand is high—and it’s just not easy to get that super soft goose plumage in the quantities that the outdoor gear manufacturers need it. Synthetic insulation can be pricey, and particularly newer high-end PrimaLoft products designed to mimic down, but it’s still the cheaper option. For example, Arc’teryx’s leading lightweight down jacket, the Cerium LT Hoody, is $379. Their leading lightweight synthetic jacket, the Atom LT Hoody, is $259. And from our sleeping bag example above, the Mountain Hardwear Lamina Z Flame costs $179 compared with $439 for the Feathered Friends Swift Nano 20. Depending on the product, you can expect to save one-third or more by going with a comparable synthetic piece. In terms of pure coziness, down wins out. It’s super warm and light at the same time, giving you that pillowy feeling that you just won’t get with synthetics (the closet approximation we know of is the Patagonia Nano-Air). For sleeping bags, it’s not even close: down is the most comfortable and warm and a high level of breathability is exactly what you don’t want in cold temperatures (it’s hard enough to keep that heat in at night). But in terms of daily use and with jackets in particular, we give the nod to synthetics. Most down jackets are too warm to wear inside, but outside of the summer we frequently keep our synthetic jacket on all day. The lower warmth and better breathability help indoors, and that makes them the more versatile piece for daily wear. In fact, our Arc’teryx Atom LT and Patagonia Nano-Air have become the de facto uniform of choice here in Seattle, and fit our relatively mild climate perfectly. This is an interesting topic: down products tend to leak over time and therefore slowly lose warmth (if you see a feather protruding, you are supposed to massage it back in as opposed to pulling it out). You can rip the relatively thin shell fabric of these jackets and lose a lot of down quickly. You can also damage the loft of your down if you leave it compressed for too long. Synthetics, on the hand, tend to slowly lose their form and the fibers break down over time, particularly if you are compressing them frequently. There are many types of synthetics and it’s very difficult to generalize about how durable they are as a whole, but keep in mind that synthetic fibers do have a lifespan. We consider durability to be a tie, and with either type of insulation, it’s key to treat it well. Proper storage is essential, including keeping your jacket or sleeping bag unstuffed in your gear closet. And cleaning the item on occasion can help remove oils and dirt. For sleeping bags in particular, it’s not a bad idea to use a simple silk liner to prevent your body oils from being in constant contact with the fibers throughout the night. Not all down jackets or sleeping bags fall neatly into one category or the other: keep an eye out for down/synthetic hybrids. Arc’teryx does this with it’s Down Composite Mapping, a system where they use down around the core of the body and synthetics in areas (cuffs, underarms, etc.) that are most prone to collecting moisture. A couple of years ago, PrimaLoft launched the first down/synthetic blend—the 2016 version is 30% PrimaLoft Gold and 70% treated goose down. 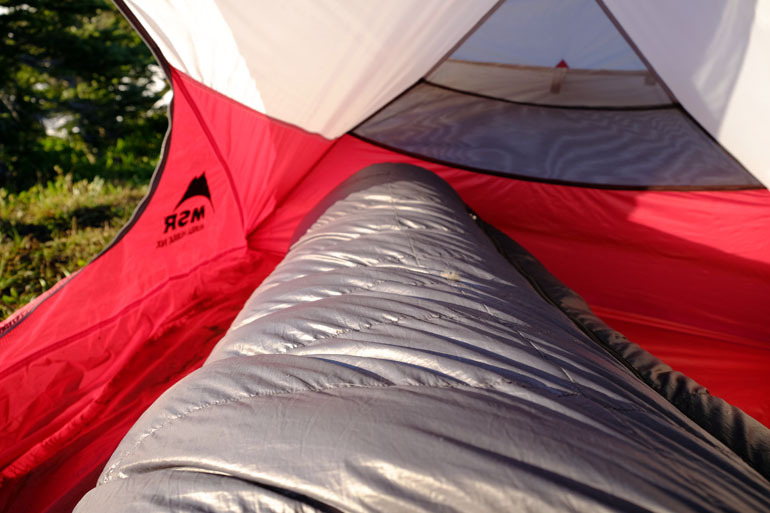 The popular REI Flash sleeping bag series uses down on the top of the bag and synthetic along the bottom to hit a nice balance of weight and price. After all of the discussion on down vs. synthetic insulation, there are important gear decisions to be made. We’ve tested a lot of outdoor gear and picked our favorites, including the best down jackets, synthetic jackets, and backpacking sleeping bags. For even more categories, check out our ski gear reviews and hiking gear reviews, both of which cover almost everything you need to get outdoors this year.